We almost didn’t notice that we weren’t skiing, that’s how much fun we had on a recent outing to the Utah Olympic Park with some friends visiting from out-of-town. Neither were we. So, instead, we drove up the hill to the Utah Olympic Park and spent the morning walking (slowly) around the park, with Seth as our tour guide, explaining the ski jumps, the freestyle training areas, and showing off his Nordic skis. We walked to the bobsled tracks, which were being prepped for competition, and scoped out the ropes course, then headed into the Quinney Visitor Center to explore the two museums inside, the Alf Engen Ski Museum and George S. and Dolores Doré Eccles 2002 Olympic Winter Games Museum. The ski adventure simulators and especially the Nordic jumping simulator, were a huge hit with all four kids. Seth got to “coach” his brother and his friends through the basics of ski jumping, as they stood on mock skis that are connected to some computer wizardry that translates the skier’s movements to an animated flying session off of the UOP’s 120 meter jump. The computer judges the jump and gives the jump distance and a score. As in regular competition, simulated jumpers get one practice jump and then two that count. After our simulated workouts, we took a quick lunch break, then headed back up to tackle the adventure courses. There are two ropes courses, one on top of the other. The lower of the two is called the Canyon Adventure Course and the upper is called Summit Adventure Course and offers more challenging obstacles. The drop tower involves a 15-second zip-line ride from just above turn 12 on the sliding track for bobsleigh, luge and skeleton, to a tower with a landing platform on one side with a 65-foot drop-zone on the other. The guides will clip your harness to one of two options for drop-line rides off the tower— one with a “controlled free fall” that transitions to a smooth ride to the bottom, the other is a smooth ride all the way down. These amazing attractions have been open for a little over a year at the UOP, but as is typical of us, we don’t often find the time to try out cool new things until we have guests in town who are interested in trying them. Ruby and Jane are zip-line and ropes course aficionados. “You’ll love it!” they took turns telling each of our boys. Before long, the kids were fitted into harnesses and helmets, and heading out the door with a UOP guide. No sooner had the guide said, “OKAY, let’s go!” than Seth realized he was heading for unknown adventure, and burst into tears. “I’m scared!” The irony was not lost on us that he’ll try anything while wearing a pair of skis. 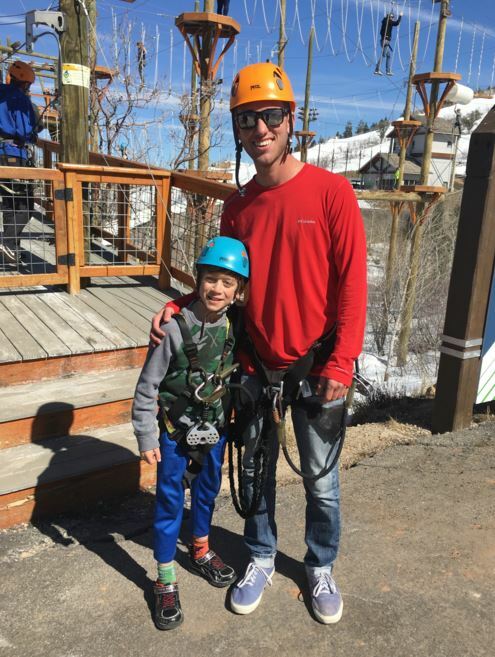 Jeff and I didn’t have a chance to react—a second guide materialized and whisked Seth off to a seat, outside, with a view of the entire adventure course, so he could explain how the zip line, drop tower and ropes courses worked. 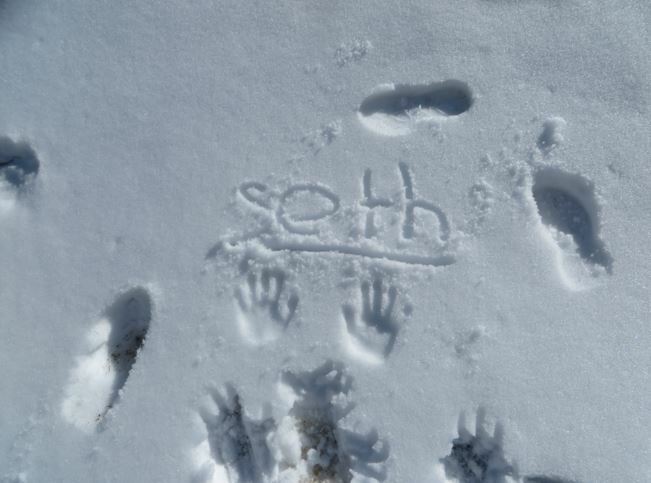 He offered to be Seth’s personal guide through the whole adventure. Jeff stayed with them while I scooted up to watch the other three kids launch from the zip-line start. After the three kids launched, I jogged the short stretch of road down to the “drop zone” so I could watch them come down. Their smiles upon landing were pretty great. Jeff, Seth, and the guide were there, watching. I smiled at the guide and thanked him. Suddenly, we all had a moment of recognition—the kind, patient, and enthusiastic guide was my friend’s son Michael, who works at UOP while attending the University of Utah. 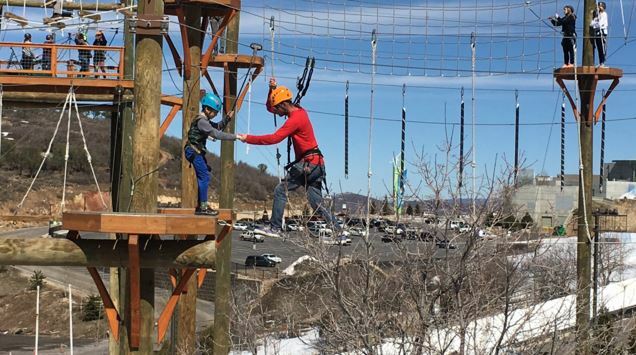 For the next three hours, we watched, first as Michael helped Seth figure out the ropes course, one obstacle at a time, and as Lance, Ruby and Jane worked their way around the Canyon Course, once and then twice around the Summit Course. and then signed off on a great day.